The Cape Cod Baseball League scored a first-round knockout Monday night, dominating the collegiate selections in the annual Major League Baseball draft of amateur players, which took place in Studio 42 of the MLB Network in Seacaucus, N.J. Of the 14 college players selected in the first round, 12 were members of Cape League teams last summer, and in the compensation round that followed, eight of the 11 collegians chosen were from the Cape League. That’s 20 Cape Leaguers among the 25 collegians drafted on the opening night – an astounding 80 percent. It was the league’s most impressive showing since the draft was instituted in 1965. A total of 60 players – 35 of them from the high school ranks -- were drafted, 31 in the first round and 29 more in the compensation round. 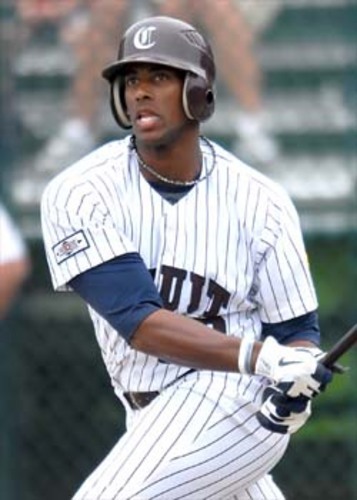 Most notable among the Cape Leaguers were Outstanding Pro Prospect Victor Roache (Cotuit and Georgia Southern), taken with the 28th pick by the Milwaukee Brewers; batting champion Stephen Piscotty (Yarmouth-Dennis and Stanford), St. Louis’s pick at No. 36 in the compensation round, and MVP Travis Jankowski (Bourne and Stony Brook), who went to the San Diego Padres with the 44th over-all pick in the compensation round. Yarmouth-Dennis and Stanford right-handed pitcher Mark Appel, the early favorite to be the first player drafted, had to hear seven other names called before Pittsburgh took him, In fact, three other Cape Leaguers preceded Appel, who split 2011 between Team USA and Y-D. His Red Sox battery mate, Florida catcher Mike Zunino, was the first Cape Leaguer selected; he went to Seattle, which picked third. Baltimore used its fourth overall pick to take LSU right-hander Kevin Gausman, who helped pitch Harwich to the 2011 CCBL championship, and Kansas City, picking fifth, grabbed right-handed pitcher Kyle Zimmer (Cotuit and San Francisco). Had the Astros taken Appel, he would have been the first No. 1 overall draft pick from the Cape League since 2006 when University of Tennessee pitcher Luke Hochevar (Cotuit, 2003) was selected by the Kansas City Royals. Hochevar was preceded as a No. 1 selection by Pat Burrell (Hyannis, 1996), taken by the Phillies in 1998; Matt Anderson (Chatham, 1996), by the Tigers in 1997; Kris Benson (Hyannis, 1994), selected by the Pirates in 1996; Darin Erstad (Falmouth, 1993 & ’94), by the Angels in 1995; Ben McDonald (Orleans, 1989), drafted by the Orioles that same June; Bill Almon (Falmouth, 1970), the Padres’ pick in 1974, and Danny Goodwin (Cotuit, 1973) twice, out of high school in 1971 and again in ’75 from Southern University. The Boston Red Sox selected three players Monday night and all of them were 2011 Cape Leaguers. With new GM Ben Cherington directing the Sox draft efforts for the first time, Boston used its No. 24 pick to take shortstop Deven Marrero (Cotuit and Arizona State). With the final first-round pick -- No. 31 overall -- the Sox selected southpaw pitcher Brian Johnson. (Y-D and Florida). Boston also picked righty Pat Light (Chatham and Monmouth) with selection No. 37 in the compensation round. Others drafted in the first round were lefty Andrew Heaney (Falmouth and Oklahoma State), taken by Miami at No. 9; righty Chris Stratton (Harwich and Mississippi State), San Francisco’s pick at No. 20; righty Marcus Stroman (Orleans and Duke), No. 22, to Toronto; outfielder James Ramsey (Y-D and Florida State), No. 23 to St. Louis; and third baseman Richie Shaffer (Chatham and Clemson), No. 25 to Tampa Bay. Compensation round selections also included catcher Kevin Plawecki (Hyannis and Purdue), No. 35 to the Mets; right-hander Luke Bard (Brewster and Georgia Tech), No. 42 to Minnesota; right-hander Pierce Johnson (Harwich and Missouri State), No. 43 to the Chicago White Sox; outfielder Barrett Barnes (Falmouth and Texas Tech), No. 45 to Pittsburgh, and right-hander Eddie Butler (Harwich and Radford), No. 46 to Colorado. The 2012 draft continues Tuesday and Wednesday, concluding after the 40th round.